Back when the British Navy was the finest naval fleet in the world the Revenge was among the great ships that helped England rule the high seas. 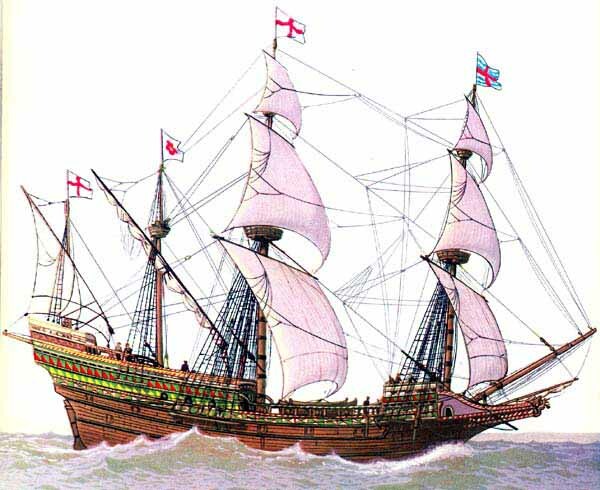 The Revenge was a 500-ton galleon built in 1577 by the leading English shipwright Matthew Baker. With its new "race-built" design, the Revenge was considered among the finest galleons in the world. The high poop deck, a feature of the older galleons, was replaced by a lower series of decks stepped down into the waist of the ship. It also had a lower forecastle forward. This made the Revenge the "long lean fighting machine" of its time. The Revenge was commanded by Sir Francis Drake against the Spanish Armada in 1588. The ship also had a long record of service in Ireland and the West Indies. The warship finally met its match in 1591 when, under the command of Sir Richard Grenville, it was destroyed in a battle with a Spanish armada in the Azores. During this historic battle the Spanish galleon Ascension and a smaller ship were lost when they collided with each other. The big Spanish warship San Felipe pulled alongside Revenge and there was a failed attempt by its crew to board the English galleon. Seven men of the boarding party died before the San Felipe broke away.